When you get a vehicle history report, which is the best: Autocheck vs Carfax? Before you answer, consider my friend Kim. She was in love with a pre-owned white Toyota RAV4 she had just test driven. She asked for a Carfax report which the salesman produced fairly rapidly. The comprehensive report listed the VIN (vehicle identification number), the states the car had been in, and the different dealers that had handled it. It showed police reports and repair shops that had dealt with the RAV4 and it also listed previous owners. This is where Carfax Vs Autocheck gets interesting: the only thing Kim’s Carfax report didn’t show was that the RAV4 was once sold at auction in Florida very soon after a series of large hurricanes there. Kim knows this because she also pulled her own separate Autocheck report. Autocheck, owned by Experian, is similar to Carfax. A unique Autocheck feature is that over 97% of the auto auctions in the U.S. are run through the Autocheck database. If a car is sold at auction, Autocheck will know. Carfax is the largest company in the industry. It was started in 1984 in Columbia, Missouri. The name plays off the word “facts” as well as the fact that the first reports were faxed in the days before email and the internet. By 1993 they were offering reports in all fifty states. Carfax claims they have access to more records than any other service. 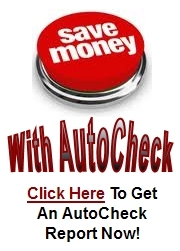 Autocheck is the second largest service. While they don’t have the high name recognition Carfax has built up, they have been quietly growing for years. They are owned by Experian. Instead of spending money on marketing they put their focus on building solid relationships with state auto agencies, car dealers and auction houses. Our Autocheck vs Carfax investigation shows Carfax has over 34,000 data sources including every U.S. state and Canadian provincial motor vehicle department. Other sources include auto auctions, fire and police agencies, auto body shops, and fleet auto managers. Autocheck has the same or similar sources with more auto auctions in their database. All Autocheck sources meet federal guidelines set forth in the federal Driver Privacy Protection Act (DPPA-enacted in 1994) and other government policies. Looking further into Autocheck vs Carfax we find that Autocheck is a division of Experian, the huge consumer data company that is one of the big three credit reporting agencies. This gives them a deep background in using multiple data points to aggregate a comprehensive report. In fact, in 2009, Scott Waldron, president of Experian Automotive claimed to the trade press, “With two times the number of reported accidents as the competition, we are clearly giving consumers a better means of understanding events in a vehicle’s history that could affect its value, reliability and safety.” This was based on a report from Pipal Research – an independent, custom research firm. 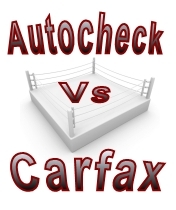 When considering Autocheck vs Carfax note that both will give you a free preliminary report. You plug in the VIN and it they tell you how many records are in the full (paid) vehicle history report. For full reports, Autocheck’s single report pricing is lower than Carfax. They also offer a higher priced option for unlimited reports. This can be very useful if you are looking at many cars and want a full report on all of them. Carfax does not offer unlimited reports, but you can choose a 5x report option. Title problems – was the car in a severe accident? Or flooded? Is the odometer accurate? Ownership History – how many owners? Is their high mileage? Was it ever a rental car? Accidents and Service – Was the car ever totaled? Is there frame damage? What is the service record in terms of oil changes, etc? Autocheck has an edge in the number of accidents reported as well as the number of auto auctions in the database. We recommend using the report as a guide for your mechanic when doing a full vehicle check. For example, if you know a car was in an accident you can pay special attention to make sure there is no frame damage. So what is the result of the Autocheck vs Carfax battle? For my friend Kim, the answer was to get both. When the Autocheck report showed that her Toyota RAV4 was sold at auction after heavy hurricanes, she had her mechanic pay special attention to check for possible flood damage–it came up clean. Without the “second opinion” of the Autocheck report, she might never have double-checked for this possibility. Cars are our second most expensive purchase in life (after a home). Getting all the information available can prevent major hassles later. Of course, Kim’s situation was pretty extreme. In the end, both Autocheck or Carfax can give you useful insight on the history of a used vehicle. If you want to save a few bucks though, stick with AutoCheck. When it comes to the Autocheck vs Carfax price battle, Autocheck is more cost effective and doesn’t limit the number of VIN number checks you can run. * Autocheck vs Carfax? We suggest AutoCheck – Click Here To Get An AutoCheck Vehicle History Report Now! Previous post: Free AutoCheck Report Example: What’s Included in an AutoCheck Vehicle History Report?